After Deadly Storms, Agency Retires 4 Hurricane Names : The Two-Way Harvey, Irma, Maria and Nate will no longer be on the U.N.'s official rotating list of storm names. The hurricanes killed hundreds of people and caused billions of dollars in damage. 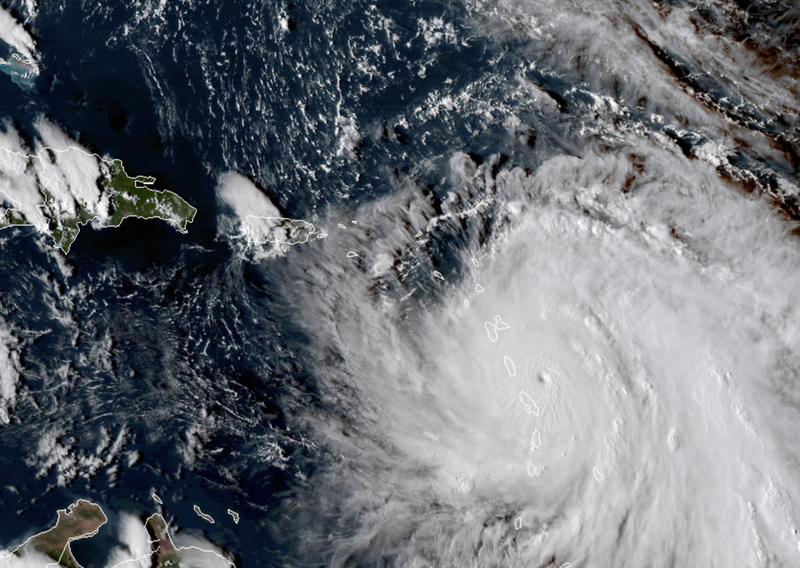 Hurricane Maria, shown here as it neared Dominica on Sept. 18, is one of the storm names that has been retired. Harvey, Irma, Maria and Nate will no longer be on the rotating list of storm names, the WMO said on Thursday. The hurricanes killed hundreds of people and caused billions of dollars in damage – more than $250 billion in just the U.S., according to WMO. The names have been replaced by Harold, Idalia, Margot and Nigel. The U.N. agency maintains this rotating list for the Atlantic and Eastern North Pacific. "Male and female names alternate alphabetically and the lists are used every six years," WMO said. "The four new names will be used in the 2023 season." Hurricane Harvey, which was a Category 4 storm when it hit Texas in late August, directly killed at least 68 people. The National Hurricane Center has called it the "most significant tropical cyclone rainfall event in United States history, both in scope and peak rainfall amounts." Hurricane Irma, which peaked as a Category 5 hurricane, made landfall seven times and hit islands in the northern Caribbean and Florida in early September. "Irma caused 44 direct deaths as a result of its strong winds, heavy rain and high surf," according to the National Oceanic and Atmospheric Administration. Hurricane Maria came next, slamming into the island of Dominica as a Category 5 storm on Sept. 19, then wrecking havoc on Puerto Rico. "Maria caused 31 direct deaths with 34 missing in Dominica, and two direct deaths in Guadeloupe," says NOAA. "In Puerto Rico, the death toll stands at 65, which includes an unknown number of indirect deaths." Hurricane Nate hit Central America and the Gulf Coast of the U.S., eventually becoming a Category 1 hurricane. It killed 45 people, according to The Associated Press. As The Washington Post reported, hurricane names started to be retired after the 1954 hurricane season, when three devastating storms hit the East Coast. "Since that fateful year, 88 names have been retired, and those beginning with 'I' made up a disproportional number of them (11 of the 88)," the newspaper writes. But the fact that hurricanes starting with "I" are especially destructive is not really a surprise, the Post notes. They "tend to coincide near the average peak of the hurricane season. With ocean temperatures warm and hostile winds shear, conditions are prime for hurricane development." The 2005 season set the record with five hurricane names retired: Dennis, Katrina, Rita, Stan and Wilma. A previous version of this story said that Wilson was among the five hurricane names retired in 2005. In fact, the name Wilma was retired.